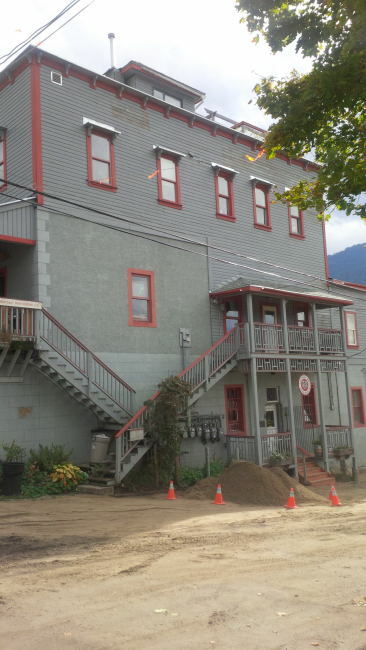 Nelson BC in the Kootenays have a well known brewery in Nelson Brewing Company. This iteration of the brewery has been brewing since 1992. This building does have some interesting history though as the original Nelson Brewing Company started here in 1897. This original brewery was combined with the 4 breweries operating in the Kootenays in the late 1950’s and was moved to Creston. If you know Macro beer you will know their current best selling beer…. Kokanee. Enough of this history lesson for now though as if you are reading this you probably could care less about that brewery or its beer. 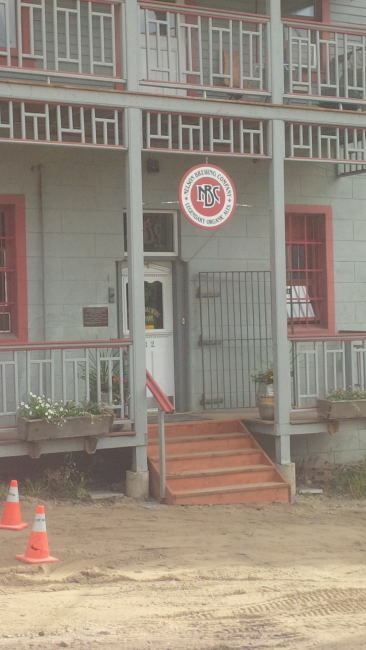 The brewery does not have a tasting room at all but more a waiting room behind the front door. There is really no reason to come to the brewery unless you have a scheduled pickup or tour arranged. They are happy to do prearranged tours though if you contact them via their website. When you walk into the brewery you can really start to see the age of this building. The building is ancient! The brewery is a fairly decent size with lots of tanks to brew their beer. They have a fairly standard bomber (650ml) bottle filler that is pretty labour intensive and a great canning line that is much less labour intensive. The space may not be fancy but is sure works well as it is making great beer. While we were on the tour the Brewmaster Mike Kelly brought up the fact that the original brewery at this location was a gravity fed brewery. With this meant that all the grains used in brewing would have to be loaded onto the roof and then dropped down into the brew system after it was milled. After we talked a bit about the history of the building and the original brewery Mike decided to take Me and the one other person on the tour to the roof to see where the original brewery started their process. Today there are actually little tiny loft apartments on the room of the building. On the way to the roof we also passed through a wood shop that also now resides inside this large old building (there are many tenants). Taking the rickety old stairs up to the roof was quite something as they are very old and creaky. It was quite neat seeing the bowels of the building though as it showed even more character. Once on the roof the view was amazing! In every direction you saw either mountains or water. I can totally understand why they now have tiny lofts on the roof! Once we finished discussing the brewery and the view we headed back down the old stairs to the room at the front of the brewery. After a short talk I had to take my leave to make my way to my next destination. I was quite impressed with the brewery and glad I had the chance to stop by and take the tour. This entry was posted in Brewery and tagged bc, beer, brewery, brewery tour, canada, craft beer, craft brewery, nelson, Nelson brewing company, Tour. Wow, I want to live on the roof in Nelson! Thanks for the tour. I’ll make it a point to get there myself. I was quite taken by the view from the roof also! Glad you enjoyed the virtual tour.